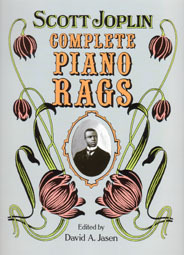 Here is the original sheet music to all 38 of Scott Joplin's piano rags, along with his "School of Ragtime". It includes the original arrangements of "The Entertainer" and "Easy Winners" made famous in "The Sting". All are piano rags with no lyrics. PUBLIC DOMAIN STATUS: All selections are reprints of original or early editions with copyright date and publisher shown. Except for "Silver Swan Rag", which was not published until 1971, all of these pieces are in the public domain in the United States. Copyright protection may exist in countries other than United States.